Model-turned-actor Lee Eon (also spelled Lee Un, most famously of Coffee Prince) has died in a motorcycle accident. The 27-year-old, born Park Sang-min, was on his way home following the wrap party for KBS’s Strongest Chil Woo early on the morning of August 21. He was riding a motorcycle and ran into the guardrail of the overpass, and is said to have died almost immediately. The news has shocked everyone; online, netizens are abuzz in disbelief. Just the night before, he had been onscreen in Chil Woo’s finale episode, and the sudden news is, to say the least, startling. Lee Eon got his start modeling, but shot to mainstream levels of fame when he took on the role of simple-hearted but lovable Min Yub in last year’s Coffee Prince. He followed that with a stint as a cable-TV MC, then returned to dramas with Who Are You? 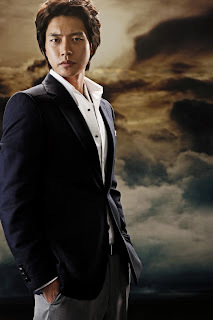 and, most recently, Strongest Chil Woo.